The spotlight has very long now been on very hot and very much in demand Chinese art resulting in sometimes exorbitant prices— and sometimes these sales are not paid for. But this is not what I want to talk about. There are several areas of fine, tribal and folk Asian art that can be purchased for under $ 5,000. He pointed to several areas: Meiji period (1868-1912), (and later Japanese art I might add) such as bronze, ceramic and lacquer objects. I can think of several that recently sold at auction in the $ 1,200 to $ 5,000 range. Depending on your budget there are also Japanese screens, Japanese contemporary ceramics, 19th century Japanese paintings— all available in a reasonable price range. Mr. Mason also mentioned art from Southeast Asia— Thailand, Burma, Cambodia, Sri Lanka (and Laos and Indonesia I might add). SEA art is my specialty and I follow it closely. Many pieces especially from Cambodia can be quite expensive in comparison with the neighboring countries. And there are Japanese woodblock prints. I just read a press release by Scholten Japanese Art participating in Asia Week with the exhibition: Ukiyo-e Tales: Stories from the Floating World. Most of you are familiar with color woodblock prints and many were made in huge quantities, are still available in large quantities or at least later renditions thereof. Authentic prints, perhaps from the 18th and early 19th century, from a specific genre (kabuki actors, beautiful woman, warriors, erotica, etc), by an artist who did not produce so many prints and might be less known— can be a good find and a little more expensive but still very reasonable for such a work of art. Scholten offers a very fine print by Eisen dated ca. 1830 for $ 3,800. A dealer whose Japanese prints I have followed for a long time – floatingworld.com – offers several 20th century ukiyo-e prints between $ 5,000 and $ 10,000 and I wish I would have purchased them when these artists were in the $ 2,000 range and it was not that long ago. Check them out and his more recent prints. Martha Sutherland of M. Sutherland mentions Chinese album leaf paintings by well known artists to be quite affordable, under $ 5,000, whereas larger works by the same artists would be quite expensive. I must not forget India— having recently appraised some Chola pieces— I am aware of the high price tag but there are lesser known periods of Indian art, such as Nayak period— as pointed out by Sanjay Kapoor of Kapoor Galleries. So we should all have fun and focus on one reasonably priced niche of Asian art— it is quite doable! Very dangerous for me who has accumulated more than I can handle. I have heard so many times that large international auction houses will not accept anything under $ 3,000/$5,000 but when you look at the sales results, you realize that this is not so. There are many items that sell for less and perhaps sell for less than they did years ago….because they are not in fashion, not well known or because buyers are caught up in another period or another artist. If you can wait and do your research you can find gems. The NYT recently (October 27, 2013) ran an article PRICES THAT FLY UNDER THE HEADLINES in their Fine Arts & Exhibits section that discusses mainly European and American art- paintings and prints – under the radar. I have blogged about Japanese bronze pieces, mainly late Meiji and Taisho period that now seem to enjoy rising prices. Great pieces can be bought under $ 5,000, under $ 3,000 or even under $ 1,000. Asian prints are still a good buy – if you cannot buy at the astronomically high prices some Chinese paintings command. Several years ago Indian contemporary and modern paintings were a good buy. I do not know much about African contemporary paintings but my son just sent me information about a November auction of paintings and some sculptural pieces in Nairobi, Kenya organized by Circle Art Agency. The dynamics were interesting-some artist were self taught, others had studied in Europe, and the buyers were from Africa and Europe. Prices for many works of art moved in the $ 2,000 to $ 4,000 range with some exception for higher priced and better known artists. I have requests not infrequently about buying Asian works of art in a specific price range – not for investment but because a client feels passionately about it. Who will make this into movie? I am in the middle of authenticating and appraising for insurance purposes and perhaps resale purposes, for a Chinese born client several 18th and 19th century porcelains (no problem) and several black ink on paper paintings signed Qi Baishi (will not do this). Client explained that there were many high auction records in China for similar ceramics and paintings. Yes there are and I was about to explain that the Chinese auction market has played havoc with appraisal values and with auction results, and with transparency, and why a Chinese artist may want to render something in an earlier style to pay respects to an earlier master (all so clearly set out in a book I recently blogged about: ORIGINAL INTENTIONS, ESSAYS ON PRODUCTION, REPRODUCTION, AND INTERPRETATION IN THE ARTS OF CHINA, Pearce/Steuber, 2012 University Press of Florida), and that as an appraiser at this time, we cannot rely so much on Chinese auction records. But instead I handed my client the NYT article spread over three and one half pages! The article explains why the art market in China has taken off so fast over the last few years, why Chinese artists rank first or seem to rank first as best selling artists in the world, why auction prices in China are so high, what in the Chinese culture entices the Chinese buyer to buy and then not infrequently not pay, how the reverence for earlier masterworks is seen as contributing to forgeries as I mentioned above, and why the raising of a paddle in the west and in China seems to have different interpretations. Is it better preserved in the hands of Western collectors and Museums? Or should it be returned to it’s country of origin–Cambodia? This is the story of who is a better steward of Cambodian art, whether it be the Cambodian government, or museums and private collectors from France and the United States. An argument can be made, that without the preservation and help of the “École Française d’Extrême-Orient,” which is dedicated to the study of Asian cultures in the field of archaeology, many of the art pieces that are considered national patrimony would not have survived until today. The Khmer warrior statue is said to have been removed from the temple site of Koh Ker some years ago, and is now being offered by Sotheby’s at auction. A foot of the statue still remains in situ. The Cambodian government requests the statue to be returned to its place of origin. Lawyers of the United States government are looking into the merits of this case. There often seems to be a fine line between preserving a culture and striping it. In this case, if the government of Cambodia can look after this statue–and if it has been looted rather than legally removed–then it should be returned to Cambodia. However, there must be assurances for museums and private collectors that they can become the owners of works of art that they have legitimately paid for. It is always exciting if as an appraiser or dealer, one comes across a piece with C. T. Loo (1880-1957) provenance. He was one of the first and probably the most well known art dealer from China who established his business in Europe. His helped put together several major private and museum collections. He also acted as a consultant to Mr. and Mrs. John D. Rockefeller in the early part of the 20th century. I recently came across an article by Yiyou Wang who researched the Rockefeller Archive Center Research Reports Online. Mr. Wang related that there was always fierce and secretive competition between art dealers. Before the 1930s, the well known Duveen brothers were major suppliers of Chinese ceramics to American collectors. Eventually, C. T. Loo took over and procured many pieces.Maybe we can learn more about the man C. T. Loo by learning about the books he kept. Christie’s auction house is presenting “In Pursuit of Knowledge: A Collection of Asian Art Reference Books” at 20 Rockefeller Plaza, New York City, commencing at 10:00 a.m. on 13 September (lots 801-929). This Asian art book sale with primarily a Chinese focus, features more than 120 titles which are useful in the study of Asian art, as well as for unearthing the history of collecting in the 20th century. 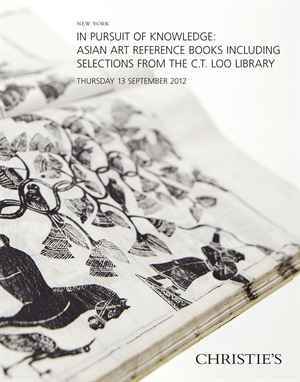 These volumes are from private collections, and offer the opportunity to come across scarcely found and out of print Asian art catalogues, references, academic journals, etc. Price estimates range from $ 500- $ 15,000. In addition to volumes owned by C.T. Loo, a highlight of this auction include eleven titles showing the private collection of George Eumorfopoulos (1863-1939) — one of the founders of the Oriental Ceramics Society in London. Six of the titles are authored by R. L. Hobson, bearing the title “The George Eumorfopoulos Collection: Catalogue of the Chinese, Corean, and Persian Pottery,” which are estimated to be priced around $ 6,000-$ 8,000. The other five titles are authored by Laurence Binyon, with the title of “The George Eumorfopoulos Collection: Catalogue of the Chinese, Corean, and Siamese Paintings,” which are estimated to be priced around $ 3,000-$ 5,000. With an estimated selling price between $ 8,000-$ 10,000, a catalogue entitled “Catalogue of Chinese Pottery and Porcelain,” displays Sir Percival David’s (1892- 1964) private collection of Chinese ceramics. Documented by R. L. Hobson, and published in 1934, David’s collection was thought to be one of the most substantial private collections of his time. Another prized volume at Christie’s auction, will be the “Catalogue of the International Exhibition of Chinese Art” (1935-1936). This catalogue features the most prestigious Chinese art exhibitions, collections, and works — documented from royal, national (Chinese), and private hands — borrowed from various nations worldwide. The estimated price range for this volume is $ 1,000-$ 2,000. I am curious to see the outcome of this auction, as there are several intriguing books listed that are virtually unobtainable today!